The Department of Defense POW/Missing Personnel Office (DPMO) announced today that the remains of four U.S. servicemen, missing in action since the Vietnam War, have been identified. They will be returned to their families for burial with full military honors. They are: Major Jack L. Barker of Waycross, Georgia; Captain John F. Dugan of Roselle, New Jersey; Sergeant William E. Dillender of Naples, Florida; and Private First Class John J. Chubb of Gardena, California. All were from the Army's 101st Airborne Division. Chubb will be buried in Inglewood, California, on February 18, 2006. 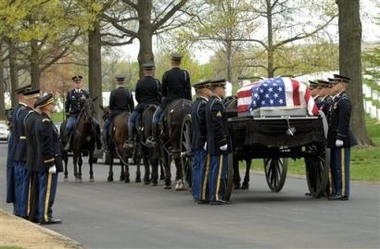 Barker, Dugan and Dillender will be buried on April 12, 2006, in Arlington National Cemetery near Washington. 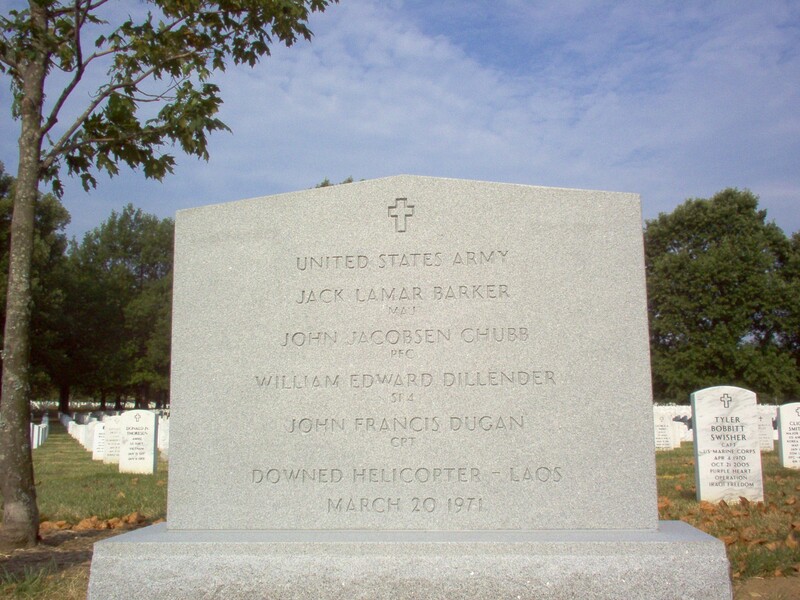 D.C.
On March 20, 1971, Barker and Dugan were piloting a UH-1H Huey helicopter with Dillender and Chubb on board. The aircraft was participating in a troop extraction mission in the Savannakhet Province of Laos. As the helicopter approached the landing zone, it was hit by heavy enemy ground fire. It exploded in the air and there were no survivors. Continued enemy activity in the area prevented any recovery attempts. A refugee in Nakhon Phanom, Thailand, showed an identification tag of Private First Class Chubb and a medallion to a U.S. interviewer in 1986. The medallion was reportedly recovered near the same general location from an F-105 crash site. However, the location and the aircraft type did not correlate with the missing aircraft and soldiers. Between 1988 and 2001, joint U.S.-Lao People's Democratic Republic teams, led by the Joint POW/MIA Accounting Command (JPAC), conducted four investigations and three excavations for these soldiers without positive results. An investigation team surveyed three crash sites in 2002 after interviewing local villagers from the province. The team recovered a fragment of human tooth and some crew-related artifacts from one of the crash sites. In October and November 2004, another joint investigation team excavated the crash site and recovered additional human remains and crew-related evidence. The wreckage was of a UH-1H helicopter, and contained insignia worn by members of the 101st Airborne Division. The remains included nine fragments of teeth that the forensic anthropologists at JPAC were able to match with etailed information from medical and dental records. From the Vietnam War, 1,807 Americans are still unaccounted-for with 364 of those from Laos. Another 839 have been accounted-for in Southeast Asia with 208 of those from losses in Laos. They waited 35 years, never giving up hope that the remains of their loved ones, whose helicopter crashed on a rescue mission in Laos, would be found. Four members of the 101st Airborne Division -- including Captain John F. Dugan of Roselle -- died on March 20, 1971, when their UH-1H Huey chopper was hit by enemy fire as they tried to rescue troops surrounded by North Vietnamese soldiers. The helicopter exploded in air. There were no survivors. Enemy activity in the area prevented any recovery attempts. On Tuesday, the Defense Department's POW/Missing Personnel Office officially announced that the remains of the soldiers had been found by search teams from Laos and the Joint POW/MIA Accounting Command. "We were notified in November they had been identified," said Debbie Winder of Waycross, Georgia, whose uncle, Major Jack Barker, was the chopper pilot. "We are just thankful we can put this to rest, and bring him home." Winder was 15 when she answered the phone and an Army official told her that her uncle was missing in action. "It was devastating," she said. "My grandmother felt like he was still alive. She could never give in that he was killed. " John Dugan was 24 and on his second tour in Vietnam when he died. In "Where They Lay: Searching for America's Lost Soldiers," author Earl Swift describes Dugan as chunky, 5-foot-6, with a passion for rock-and-roll, cars and the New York Yankees. Dugan graduated from Roselle Catholic High School and attended Union College in Cranford, then surprised friends by eloping with his sweetheart, Barbara, in Maryland. Dugan signed up for Army Officers Candidate School and went to Vietnam in 1968 as a forward observer. He received a Purple Heart and Bronze Star, but never mentioned the decorations to his family, according to Swift. Impressed with helicopter pilots because they helped people, Dugan went to flight school in Texas, then volunteered for combat because he felt the Vietnamese needed American help. His mother tried to talk him out of going back to Vietnam, Swift said. Before leaving for the final time, in 1970, Dugan treated her to a Yankees game. Search teams had been looking for the remains of the missing crew since 1986, when a Thai refugee showed an identification tag of one of them, Pfc. John Chubbof Gardena, Califfornia. Between 1988 and 2001, the search teams went out again, digging three sites, with no results. In 2002, the teams recovered a fragment of a human tooth and some crew-related artifacts, the Department of Defense said. In October and November 2004, another joint team excavated a Huey crash site and recovered additional human remains and crew-related evidence. The Huey contained insignia worn by the 101st. The remains included fragments of teeth that forensic anthropologists at the Joint Command were able to match, using detailed information from medical and dental records. Barker was identified through dental records, said a nephew, Steve Hinson of Brunswick, Georgia. "I was [Barker's] ring bearer at his wedding," Hinson said. "It's just like a dream. For us, it's been 30 years ... and just for him being found ... it's been just remarkable." Hinson has kept in touch with relatives of the crew members. "I talk to [Sgt. William Dillender's] brother once a week," Hinson said. "We're pretty close. He's now ready for this chapter to close." Hinson also recently talked to Chubb's brother. Dugan's relatives could not be found Tuesday. Barker and Dugan were piloting the helicopter with Dillender and Chubb on board while on a troop extraction mission in the Savannakhet province of Laos. Officials said that as the chopper approached the landing zone, it was hit by heavy enemy ground fire and exploded. There are still 1,807 Americans unaccounted for from the Vietnam War, 364 of those from Laos, the Defense Department said. Chubb will be buried in Inglewood, Calif., this week, and Barker, Dugan and Dillender will be buried at Arlington National Cemetery in April, said the Defense Department's POW/Missing Personnel Office. I have no idea how to make contact with those responsible for the services at Arlington for my brother and the three other members of his crew who were buried on April 12, 2006. I realize there are a lot of people who made this possible, but at this time, I'm most interested in relaying my, and my family's sentiments. If at all possible, would you please facilitate the delivery of this e-mail to any and all who participated? From the beginning to the end of the services (Old Chapel and the actual burial), we were in awe and seemingly in another world. I guess in our case, we were back in the reality that we have lived our entire lives. We love, honor and respect our god, our country and our family above all things. We were raised that way, we raise our children that way, we live that way and we continue to expect nothing less. We tried to take in every aspect of the services, from the funeral home to the Old Chapel to the actual burial and departure from Arlington. It was clearly too much to grasp all of the meanings of all the little things that we observed and experienced. That is why I am writing to you over a month after the ceremonies. To every soldier that participated, I want them to know that their professionalism, expertise, attention to detail, and unwavering determination did not go unnoticed. I saw up close the meticulous manner in which they dressed, every movement measured and calculated, and finally, an absolutely beautiful delivery. I'm sure it wasn't perfect to every one of them, but to us, it was just that, absolutely perfect. My three teenagers were afforded an opportunity to see the why behind a lot of things that are sometimes just too hard to explain adequately with words. My oldest, Austin (16) was immediately affected by the composure, precision and determination of every soldier and participant. He has for a long time made his desire to be a soldier known to all who would listen. The ceremonies solidified that and endeared him to many others by giving him the strength to stand up in front of a large crowd at the funeral home and proclaim, "He was my uncle and I want to be like him." My other two were deeply affected as well. All three did presentations in their classrooms upon their return to school and shared many of the lessons they learned. We stayed in D.C. for the week following the ceremonies and toured the Smithsonian and many of the memorials. It was evident that Austin, Daniel and Erin had paid attention to the events that brought us there. At the Korean War memorial, the WWII memorial and the wall, I watched them look not only at the stone and etchings, but at the significance of many little details that they would have normally passed over without a thought. They looked into the eyes of many who stopped to take pictures, and many who had "been there." They noticed not only the big things, but the little things that only a few truly take in. And, they brought it home with them. They brought it home in little ways that they will not notice for years. They brought it home in big ways that will help to shape them into the fine, patriotic, caring and productive American adults they will become in the future. Bill was my brother and my hero long before he went to Vietnam. 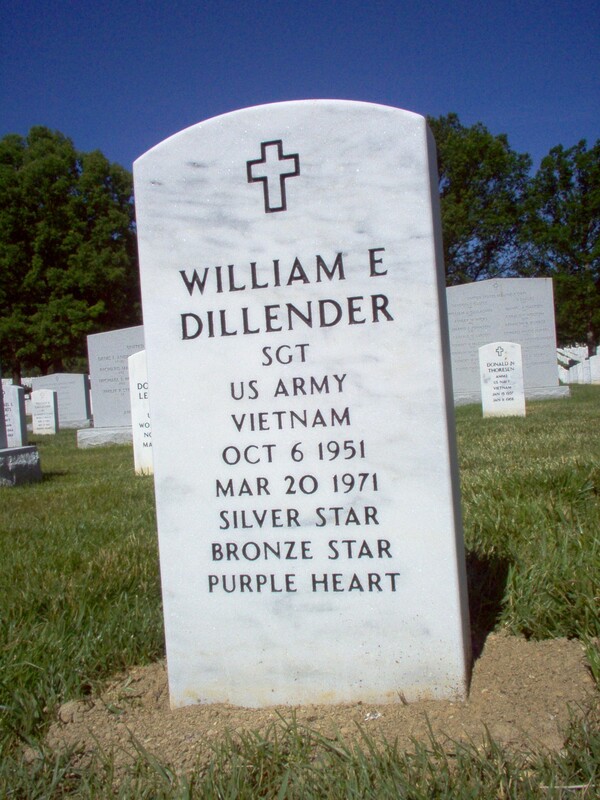 When he died, our hometown, Naples, Florida, was not all that kind to Vietnam veterans. It is now, and that is due, in no small part, to the dedication and commitment of honorable men and women like yourselves. You did him and his crew justice and my family a great honor. And, I am keenly aware of the fact that you do it every day, day in and day out, all year long, honoring and showing care for those who gave the ultimate sacrifice for a cause much greater than themselves. My kids were given the opportunity to see why their dad gets teary eyed anytime, anywhere, Taps is played, a soldier dies, or when we watch a movie like "We Were Soldiers Once." They now understand why he gets mad when people disrespect this country, soldiers, the flag, or the principles that this great country was built on. And, they understand that it is THEIR country too and they have a right to stand up for it and stand proud in it's defense. Not the least important is the fact that you brought a sense of peace and comfort to a 75 year old mother of a fallen soldier. You showed her that people cared about her loss, many of them much more than any of us ever imagined. You helped her reach a level of peace unattainable for her for over 35 years. For all of the above, and much more than I can adequately describe here, Thank You.